The Advanced Media Player Biofeedback Software program enables biofeedback training with any dvd program as an add-on for your Alive Clinical System. You get Train with heart rate feedback for hours while watching your favorite movies for immediate, intuitive feedback in your own home. The Advanced Media Player Biofeedback Software is one of Somatic Visions most popular games for neurofeedback, and is now available for use with Alive – just open Alive and select Advanced Media Player from the games drop down list. All sessions are saved and count towards Alive points and training time. Increase the difficulty level of each challenge as you begin to master your new skills and are comfortable practicing them in your everyday life. Have fun watching your favorite movies while training your mind body reactions. Allow the music to flow with your thoughts. Always have new and improved environments ready to use. Follow relaxation suggestions to see your improvement. Easy to change between accurate stress measurements and test levels. Music changes volume with your stress responses. Line graph and numeric displays quantify your changes. Responds to heart rate, heart coherence (HRV), finger sweat and sweat stability. You can track your Heart Rate Variability, or Skin Conductance -- your 'coolness and control' under pressure in REAL TIME as movies, or video 'tests' tug and pull your emotions -- graphed right on the screen. Here are just two examples of countless possible screenshots for your Advance Media Player Biofeedback Software. 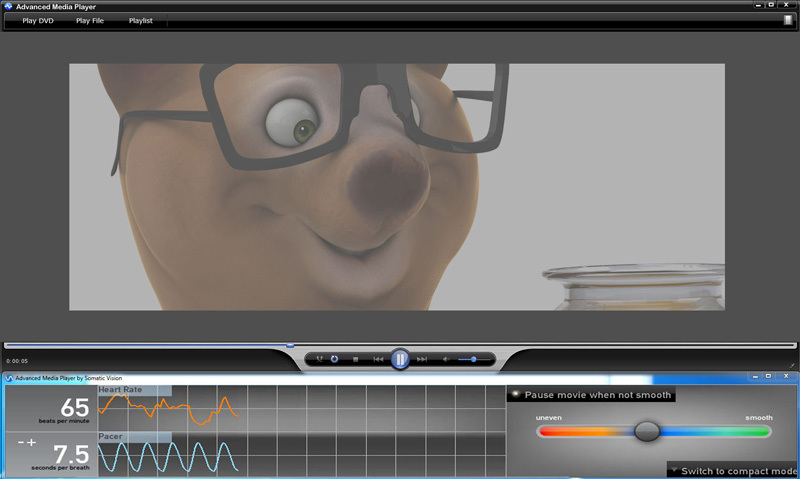 Here are two more examples which show another side of what you can view and do in your Advance Media Player Biofeedback Software. 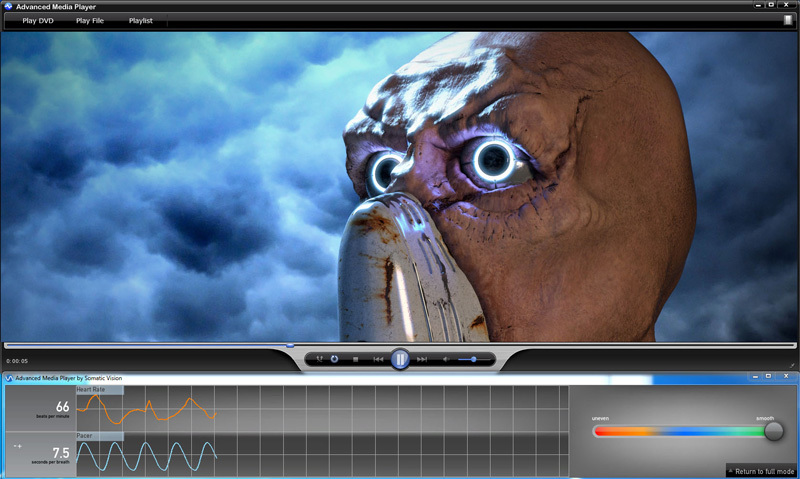 Why add The Advanced Media Player Biofeedback Software to Alive? Train for hours without getting bored. 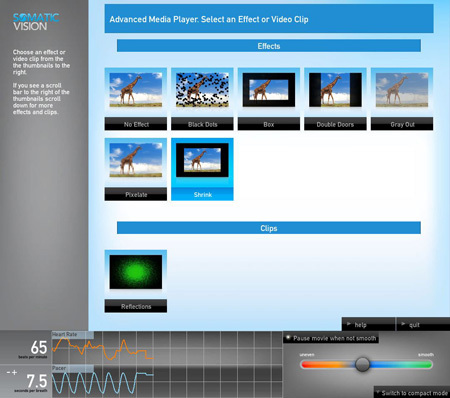 Advanced Media Player uses the IOM readings to link biofeedback data to alter the displays of your choosing. Makes heart rate smoothness training fun and easy. Skin sweat feedback is available when used with Alive Clinical. 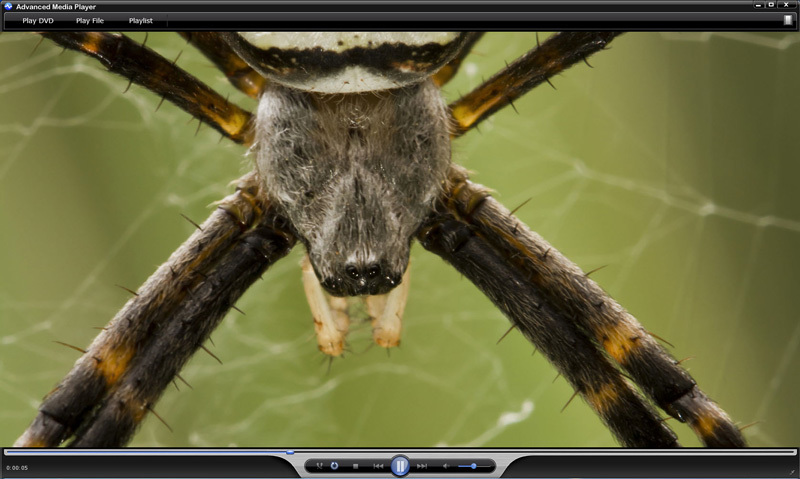 Train with video clips that trigger specific fears or difficulties. View educational content while training for an improved learning experience. Alive or Alive Clinical Software with any Alive compatible Hardware Sensor System. Your Advanced Media Player Biofeedback Software may only be used on one computer at a time. 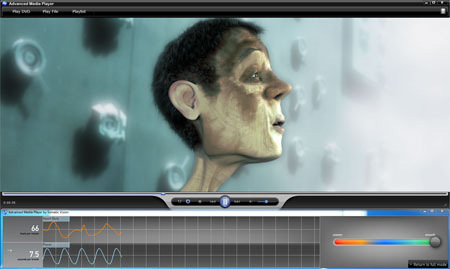 The Advanced Media Player Biofeedback Software can be installed on two computers as long as only one copy of Advanced Media Player is in use at any given time. *Requires Clinical Alive Biofeedback software & hardware sensors.